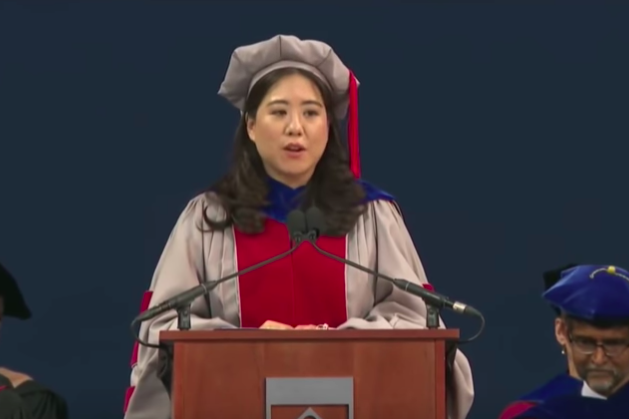 Dr. Vanessa Chan delivers a commencement speech to Penn's engineering graduates. Expecting and handling failure is a cliché in graduation speeches. "It's OK to fail." "You're all going to fail in life." "How to fail successfully." You get the picture. The overarching theme is always some version of this: Failing is actually a good thing because we learn from it and better ourselves as a result. It's good advice, but we've all heard it a million different times. Failing is like farting. It's natural. We all do it. We just don't like to admit it. Like when my Ph.D defense was delayed because I missed a deadline, pothole, or when my factory messed up my order for QVC, crevice, or when I was forced out of a client situation that felt impossible to recover from, deep abyss. Some of these I fell into because of my own stupidity. Some, I got shoved into because of corporate politics. While others, I leaped into to explore the unknown. Regardless of the reason, all of you will fall into huge potholes — just like all of us. It is true that, just as everyone will be unsuccessful at some life endeavors, everyone releases gas from their bottom — and most of us don't like to talk about either. You can watch Chan's entire speech below and request a transcript from her aptly-named website here.